During a Brite/Euram Project several European partners developed and produced an integrated monitoring system. So the inspection and maintenance costs and the traffic impairments can be reduced. One part of this project was related to portable techniques for evaluation of reinforcement corrosion. During this work a newly developed, hand held, easily to handle, portable equipment based on the galvanostatic pulse method (GPM) was tested. This paper deals with the results and analysis of the GPM measurements performed on a highway-bridge exposed to de-icing salts as well as the results of laboratory tests. Results of average corrosion rates determined by weight loss and galvanostatic pulse technique were compared. Special attention was paid to the comparability of instrument readings to real behavior. Finally the necessary precautions which need to be taken when the on site data are used for life prediction of structures are discussed. The major part of the European infrastructure has reached an age where capital costs have decreased. But inspection and maintenance costs have grown such extensively, that they constitute the major part of the current costs . During a Brite/Euram Project several European partners developed and produced an inte-grated monitoring system. So the inspection and maintenance costs and the traffic impairments can be reduced. Additionally the operator of the structures will be able to take protec-tive actions before damaging processes start. One major part of this project was the determination of the corrosion stage at the rebars in new and existing structures depending on the deterioration of the concrete. Newly developed portable equipment using the galvanostatic pulse technique  was tested on-site and at laboratory conditions. The objective of laboratory tests was the evaluation of the suitability of portable monitoring equipment for non-destructive and unambiguous determination of reinforcement corrosion. Comparing the achieved results regarding their accordance to real conditions should provide background information for interpretation of on-site situations. 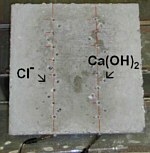 The galvanostatic pulse technique has been introduced for field application in 1988 to overcome problems with the interpretation of corrosion risk of reinforcement occurring when half cell potential readings are applied in wet, dense or polymer-modified concrete, where access of oxygen is limited. Since introduction of this technique the development work is conducted in order to allow the quantitative evaluation of the ongoing reinforcement corrosion [3, 4]. 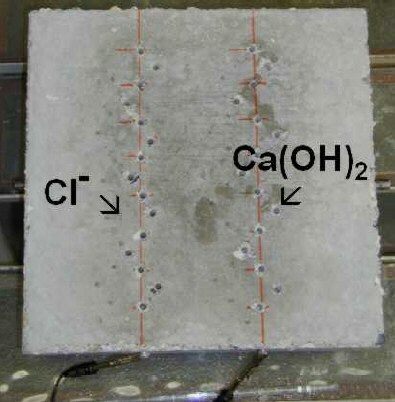 Galvanostatic pulse method is a rapid non-destructive polarization technique which has been used for evaluation of reinforcement corrosion both in laboratory and on site. A short time anodic current pulse is impressed galvanostatically to the reinforcement from a counter electrode placed on the concrete surface together with a reference electrode. The applied current is normally in the range of 5 to 400 mA and the typical pulse duration is up to 10 seconds. The small anodic current results in change of reinforcement potential which is recorded as a function of polarization time. Reinforcement is polarized in anodic direction compared to its free corrosion potential.The typical potential transient response is shown in figure 1. Fig 1: Typical polarization pattern. Fig 2: Equivalent circuit simplifying the conditions at einforcement in concrete. where B is an empirical constant determined to be 25 mV for actively corroding steel and 50 mV for passive steel. The DC polarization resistance technique with calculation of the instantaneous corrosion current (Icorr) from Stern-Geary-equation, has been applied extensively since 1970. The problem is, that in real structures the area of the counter electrode is much smaller than that of the working electrode (reinforcement) and the electrical signal tends to vanish with increasing distance. As a result, the measured effective polarization resistance can not be converted to a corrosion rate. To overcome this problem a second concentric counter electrode (Guardring) is used to confine the current to the area of the central counter electrode (figure 3). Fig 3: Conditions on Puls-head. When the diameter of the reinforcement and the exposed length of the reinforcement (counter electrode diameter) are known the instantaneous corrosion rate can be calculated. It is important to emphasize that the obtained corrosion rate is an instantaneous average rate for the confined area that strictly apply to the measuring conditions. Exposure conditions, especially temperature and concrete humidity can alter Icorr by a factor of 10 or more. Experimental data from on-site measurements have shown that average corrosion rates determined from Rp-measurements in the case of chloride induced localized corrosion underestimates the real corrosion rate by a factor of 5 - 10 or even more . From an engineering point of view such local reduction of reinforcement cross section is dangerous for the safety of structures especially in zones with high tensile or shear forces. For on-site testing the Skovdiget bridge north of Copenhagen, Denmark, built in 1965 - 67, was chosen, as the bridge has serious problems with most of the relevant deterioration mechanisms (chloride, carbonation, corrosion, ASR, freeze/thaw). Fig 4: Corrosion rate at one column of Skovdiget bridge 2000 and 2001. Initial inspections, core investigations and chloride profiling in 1999 pointed out one column to be attractive to corrosion rate measurements . Electrical continuity in the reinforcement was checked and the column was prepared for permanent surveillance. In September 2000 and in April 2001 corrosion rates (figure 4) were determined as well as the halfcell potentials. The highest corrosion rate is up to 32 mA/cm2s at 300° at level 33 cm at a potential of -200 mV vs. Ag/AgCl. At the same level at 90° the corrosion rate is 7 mA/cm2 at a potential lower than -350 mV vs. Ag/AgCl . The potential level here indicates lack of oxygen in agreement with the somewhat lower corrosion rate. The variations of corrosion rates in September 2000 and April 2001 are shown in figure 5. Fig 5: Variations of selected corrosion rates (in 0,3 and 1 m height) at one column of Skovdiget bridge. As already reported [8, 9] there is a change in the corrosion rate over the year due to changes in temperature and water content in the pore water system. These data show that the changes at some points can change in either direction with a factor of at least 2. Exposure of the reinforcement in 1999 at 90 ° and at level 0.1 m showed reinforcement cross section reduction in the range of 1 - 2 mm. A cross section reduction of 2 mm over 33 years corresponds to an average corrosion rate of approx. 5 mA/cm2. Assuming that the corrosion did not initiate before 10 years,increases the average corrosion rate to 9 mA/cm2, which is within the range of corrosion rates determined at this position by the GPM . Fig 6: Perforated specimen after filling holes with NaCl resp. Ca(OH)2-solution. Parallel to the on-site investigations a number of laboratory tests were made. Concrete blocks were made of various compositions (chloride content, w/c-ratio, reinforcement locations). The corrosion rate was measured regularly by GPM to determine the variation of the corrosion rate over time (figure 10). After achieving stable values measurements were performed at different locations and compared to readings obtained at dry conditions (i. e. before NaCl-injection). As well the potential  as the current density readings show activity on rebar A, where NaCl was injected. On dry (passive) specimens no significant difference at the current density could be observed (figure 7). On wet specimens both diagrams clearly show active stage on rebar A whilst B and C remained passive (separated bars). Connecting active and passive rebars does not show any surface area effects. All values are dominated by the active partner. This leads to the problem, that the current density value shows activity but does not mean anything in terms of calculating corrosion rate if the surface area is not known. Fig 7: Current readings at different locations and various rebar configurations. Additional tests evaluating the behavior of the specimens and the performance of GPM were carried out. After completely wetting trough the drying out behavior of the block was evaluated for a 1200 h time period. For that the short-circuit current between rebar A and B was recorded and than related to the whole surface of the rebar A. After a quick decrease of short-circuit current during the first 7 days from 4.2 mA/cm2 to 2 mA/cm2, decreasing rate slowed down during further observation. After approximately 1000 h an almost constant value of around 0.4 mA/cm2 has been reached (figure 8). Fig 8: Influence of drying out process on short-circuit current and results of GPM-measurements. Measured potential increased from -360 mV to -250 mV (vs. Ag/AgCl) within the same time frame. Potential difference between both rebars was around 100 mV during the whole time. For simulation of a strong localized attack a 2%-NaCl solution was filled into the center bore hole and potential distribution on the surface was evaluated again. Directly at that bore hole potential dropped to -340 mV (vs.Ag/AgCl). A potential decrease was also observed in an area of ± 5 cm around the filled hole. Further away no significant influence could be detected. After wetting the whole surface of the block potential mapping was repeated whereby all other conditions were the same. Hereby also in the edge areas a significant potential decrease was measured (figure 9). Fig 9: Potential mapping and GPM-measurements on block KRM rebar A at various conditions. Using GPM much smaller potential difference between measurement points were obtained, than at the potential mapping performed directly before. By wetting of a larger surface area, local potential values below the measurement head were averaged. However the increase of concrete conductivity caused by wetting could clearly be detected. No major corrosion rate deviation (current density) was observed. Long time observations by periodic pulse measurements showed significant differences between specimens containing chloride from the beginning (cast in) and chloride free specimens . Directly chloride exposed rebar A of the specimen showed during the first weeks a more quickly increase of current density values from below 1 mA/cm2 up to 4 mA/cm2. Afterwards the current density values varied caused by temporarily drying out. After 2500 h ponding was restarted whereby current density again significantly increased (figure 10). Fig 10: Current density values on separated and connected rebars of specimen KRM with perforated concrete cover and chloride ponding on rebar A, rebar A and B connected. During exposure rebar A and B were permanently connected. Pulse measurements (open triangles) at these conditions showed essentially the same behavior of current density and potential as on directly exposed rebars A. Fig 11: Surfaces of dismantled rebars (after pickling of the corrosion product). By integration of the current course considering the polarized area the charge amount (Q), transferred during the experiment time, can be obtained. Dividing that charge amount by the exposure time tA an average corrosion current im can be calculated. By division of that amount by the surface area of the rebar (A = 31.4 cm2), average current density im is obtained, which would cause the same charge transfer by integration over time. For such comparison after 8 months the blocks have been destroyed, and weight loss at the rebars was determined by pickling off the corrosion product (figure 11). From obtained weight loss and the exposure time corrosion current density icorr was calculated by Faraday's law. Table 1: Current density values calculated from weight loss and obtained from GPM-measurements. The comparison of the current densities obtained by pulse measurement and by integrated weight loss rate is shown in table 1. Values show a relatively good correlation. Small deviations can be explained by the influence of the length of rebars on the confined area. It is important to emphasize that the obtained corrosion rate is an instantaneous average rate for the confined area that strictly apply to the measuring conditions, strongly depending on active corroding surface area. To overcome this problem it was necessary to integrate the frequent corrosion rate measurements over time in the laboratory for comparison of the corrosion rate determined by weight loss measurements. The results from the laboratory show very good correlation between cor rosion rates determined by weight loss and corrosion rates determined by GPM. Corrosion rates obtained on-site by the galvanostatic pulse method are comparable to average corrosion rates calculated from actual cross section loss at places where the actual corroding area is the same as the confined area. It is obvious that wrong estimation of the amount of reinforcement (for instance rebar locations) make the average corrosion rate to high but also cracks and delamination are often the reason for wrong corrosion rate estimations. For lifetime predictions a more detailed knowledge of the daily and seasonal changes of corrosion rate is required in order to obtain meaningful values. It is essential to combine the corrosion rate measurements on-site with fixed post mounted corrosion, humidity and chloride sensors or a number of other non destructive evaluation methods to determine the concrete integrity and penetration rates. This work was funded by the European Community as a Brite/Euram-project, contract number BRPR-CT98-0751. Authors gratefully thank for the support. Furthermore contribution of all partners within this project, as in addition to the authors there are Autostrade, Danish Road Institute, OSMOS-Dehacom, DLR, Rambøll and S+R Sensortec, are deeply acknowledged. Frølund, T.; Klinghoffer, O.; Poulsen, E.: "Rebar Corrosion Rate Measurements for Service Life Estimates", ACI Fall convention 2000, Toronto Canada.